Bring on the snow.. Say What? It's time for some fun with the Alley Way Stamps. Today I'm using the new set Waddles Pals along with the new snow stencil from MFT for a fun winter card. It's perfect because we got dumped with a good amount of snow yesterday.. But today the sun is out and it's slowly melting away and warming up a bit. I added the snow with some white embossing paste and the snow stencil onto a piece of Kraft cardstock and then I die cut the hills with the Landscape trio dies from Mama Elephant. 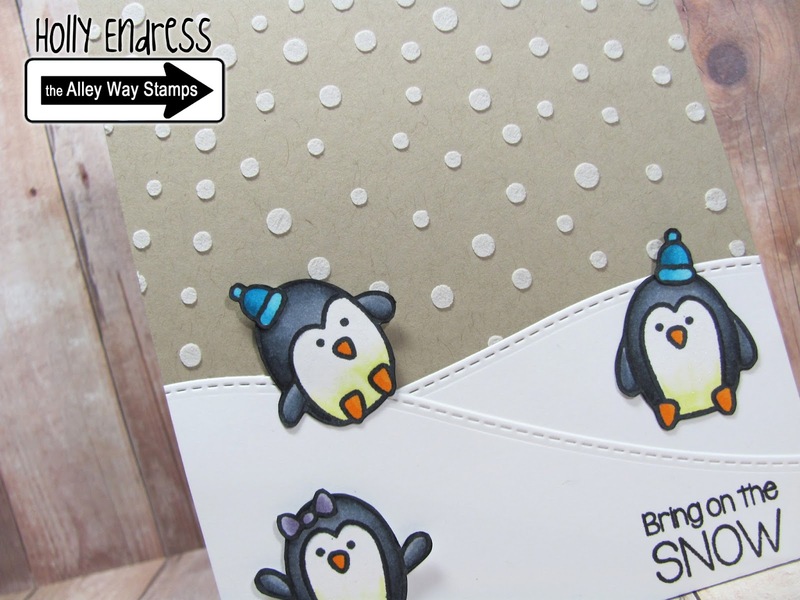 I stamped the penguins onto some white cardstock using memento tuxedo black in and colored them in with Copics! I stamped the sentiment from the same set along the bottom edge with some Black Licorice ink from Lawn Fawn. So cute.. it's hard to see in the photo but there is some Clear Wink of Stella on the bellies of the penguins and one the snowflakes. 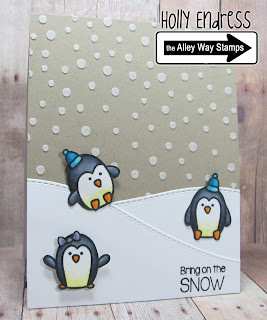 Head over to the Alley Way Stamps blog for more fun inspiration.. And don't forget to Link up with us all month long for a chance to win a set of your choice! Those little penguins are just way too cute; and they're adorable playing in that fun snow scene! Eeeks to snow! I don't want it on the ground but I will definitely take it on a card, especially a cute one!